At the federal level, which can be charitably described as unstable regarding postions and personnel, officials like Jeff Sessions want to go back the failed approaches that have made the so-called war on drugs so unpopular. The good news is that, at the local level, there are a lot of brave and forward-thinking law enforcement professionals willing to try something new—even if that something may not “politically correct,” in terms of the traditional, failed approaches. Nashville, North Carolina — He’s only 24 years old, but he struggled with addiction for more than a decade. Thomas Spikes now owes his sobriety to none other than the chief of police in this small eastern North Carolina town. 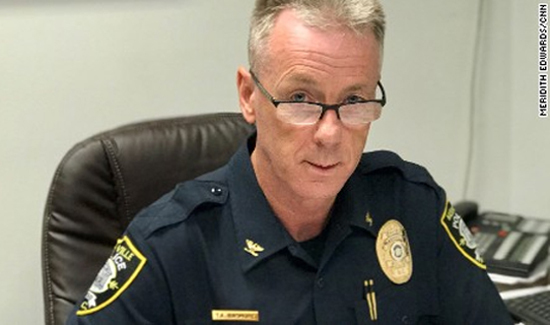 That program, called the HOPE initiative, is a collaboration between Nashville’s town manager, Hank Raper, and Chief Thomas Bashore (pictured above). As deaths from opioids continue to dramatically rise across America, topping the list for unintentional deaths at a higher rate than car accidents, North Carolina saw more than a 340% increase from 2010 to 2016. “There’s no clear characteristic of what a heroin or opioid addiction looks like. It’s not a white problem, it’s not a black problem, it’s not a Hispanic problem, middle class, working class, upper class. It affects all peoples of all walks of life,” Raper said. So, the conversation began on how this small town of 5,400, where everyone knows their neighbors, could get ahead of the problem. The HOPE initiative, modeled after the innovative “Angel” program in Gloucester, Massachusetts, which opens the way for addicts to get police assistance and medical help without fear of arrest, is a way of rethinking law enforcement’s role in responding to this growing epidemic. “They walk into the front door, if they have drugs or paraphernalia on them at any time, they can turn it in to us at that time, and have no charges filed. And we facilitate them into recovery,” Bashore said.